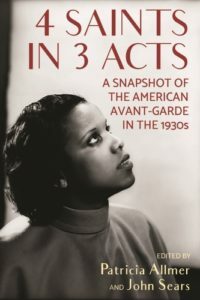 Dr Patricia Allmer – a Senior Lecturer, Chancellor’s Fellow and Deputy Director of Research at Edinburgh College of Art (ECA) – has co-curated an exhibition, 4 Saints in 3 Acts – A Snapshot of the American Avant-garde, at The Photographers’ Gallery in London that is the first of its kind in the world. But hurry, the exhibition closes on the 11th February! The surrealist elements of 4 Saints are studied on Dr Allmer’s undergraduate option course Breaking Frames: Women Artists and Surrealism, and exploring little-known artists and works, revisiting established narratives, and disseminating research across different audiences is also a strong emphasis in her PhD supervision. The public events programme includes a US Embassy/BAAS funded talk by Professor Emily Bernard (University of Vermont), and the exhibition’s research was supported by TERRA Foundation and BA/Leverhulme funding. The accompanying catalogue, co-published by Manchester University Press and The Photographers’ Gallery, includes essays by ECA colleagues Dr Lucy Weir and Professor Christopher Breward. Article re-posted by kind permission of Edinburgh College of Art. To celebrate the amazing success of the 4 Saints in 3 acts exhibition, we’re offering a special 20% discount when you purchase your copy of the catalogue on our website. Simply enter discount code OTH787 at the checkout (valid until 28/02/2018).